For many people walking on a beach or spending time in beautiful parkland evokes a state of relaxation. By spending time in nature, we feel calm and renewed with a greater sense of overall wellbeing. However, did you know that there is a scientific reason why connecting to the Earth is one of the most important things you can do to promote your health and turn back the clock? Samantha Russell explains. I recently discovered a particularly inspiring book entitled, Earthing: The Most Important Health Discovery Ever? by Clint Ober, Stephen T. Sinatra MD and Martin Zucker. The authors highlight the steep price we are paying in our modern age in which people have scarce physical connection to Earth’s healing electromagnetic field. If this notion seems trite, think again. Scientifically speaking, our planet is a sextillion metric ton battery, replenished by lightening, solar radiation and molten core activity. The rhythmic pulsation of the Earth’s battery emanates a natural energy that keeps biological systems in balance. Nowadays, entire communities live in insulated houses, drive cars with rubber tires, wear thick-soled shoes and work in offices elevated many storeys off the ground, systematically insulated from the Earth’s healing energy. Medical Earth researchers are beginning to discern that this disconnection from the Earth has a deleterious impact on our health, including the rise in auto-immune disorders and chronic inflammation that leads to a variety of life threatening conditions as well as accelerated ageing. Studies show that when the human body is reconnected to the Earth’s electromagnetic field through direct skin contact with the Earth’s surface or through the use of Earthing technology, systems function more effectively, even in a matter of minutes. Therefore if we were able to incorporate connection to the Earth’s electromagnetic field into our daily lives, even for a short time each day, the benefits would be noticeable and also incremental. 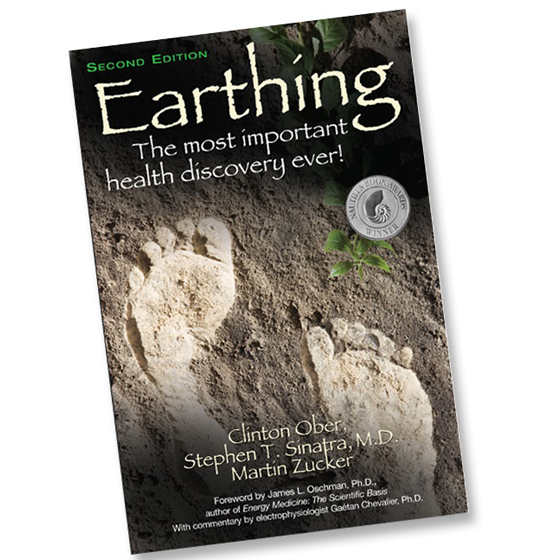 According to author Dr. Stephen T. Sinatra, Earthing provides a variety of rejuvenating wellness boosts such as: improved sleep, increased energy, reduced hormonal and menstrual symptoms, thinner blood and improved blood flow, dramatically accelerates healing, relief of muscle tension and a calming of the sympathetic nervous system. The most compelling advantage includes neutralising the destructive activity of free radicals, reducing chronic inflammation, restoring the integrity of the human electromagnetic field and protecting against EMF pollution, all of which slows the ageing process and protects against auto-immune dysfunction as well as diseases caused by chronic inflammation of the body. It comes down to subatomic particles that carry a certain electrical charge. Inside your body there are destructive molecules called ‘free radicals’, which are natural byproducts of the process of metabolising food. Free radicals also come from exposure to UV rays, x-rays and toxins in the environment such as pesticides, cigarette smoke, car exhaust and industrial fumes. Free radical molecules are missing one electron in their outer shell, which creates a situation in which each free radical molecule will steal an electron from another healthy cell or atom in your body. Free radicals can damage cell structures so badly that immunity is impaired and DNA codes are altered. If left unchecked, this process can create carnage that begins at a cellular level and as these damaged cells accumulate, the organs and systems they belong become compromised. Your body’s automatic response to an injured cell is to create inflammation, which is a healing response that creates a pooling of nutrient and oxygen-rich blood and white blood cells that clean up areas of cellular damage. Since free radicals are continuously entering your system, there is continual damage being done by them on a cellular level, which means there is a continual inflammatory response going on. In the short term, inflammation helps healing, but long term, chronic inflammation is dangerous to your health because it interferes with proper functioning and creates an environment inside the body that actually prevents the body’s ability to heal itself. The Earth naturally radiates a negatively charged electromagnetic field, negative because it contains ions called ‘free electrons’ and electrons have a negative electromagnetic charge. When earthing, these free electrons flow into the body, filling up the missing electron site on free radical molecules, thereby neutralising them. This satiation of free radicals prevents them from stealing electrons from healthy cells and atoms in your body. In a nutshell, earthing stops the cycle of chronic inflammation, unleashing all that energy to be made available for the body to use in healing itself. Although eating a healthy diet and avoiding UV rays and toxic chemicals can reduce some free radical accumulation, another easily accessible boost you can give yourself is to neutralise free radicals by giving them the free electrons they need, by simply touching the Earth. By cleansing the individual electromagnetic field, earthing protects the immune system from EMF Pollution. Many forget or were not even aware that all living things generate a field of electromagnetic energy around them, and this field is an important contributor to physical, mental and emotional health. For some birds, for instance, the electromagnetic field assists them with navigating migratory routes. Eventhough it is not visible to the naked eye, each human has their own field which is part of the real energetic anatomy of the human body. According to cutting edge modern medicine and quantum physics, scientists believe that this field plays a vital role in supporting our health, such as providing the ideal electromagnetic environment for the electrical activity of the heart. By connecting to the Earth’s electromagnetic field we can help restore our own. This is significant, because we are continuously exposed to artificial electromagnetic fields produced by Wi-Fi, cell phones, electrical outlets, appliances and computers etc. This invisible form of electromagnetic pollution interferes with the proper functioning of the normal electromagnetic field of the human body. According to Stephen T. Sinatra artificial EMF pollution is considered to be a major cause of immune weakness and auto immune dysfunction that can lead to serious health conditions. And besides, anybody who spends long hours in front of a computer knows the level of fatigue they feel at the end of the day resulting from exposure to artificial EMF’s. If spending 15 minutes a day walking barefoot on a beach or lawn is impossible, technology has come to our aid by developing convenient products that can help us connect to the Earth while at home or at work. Earthing mats, sheets and other products that allow you to be connected to the Earth anytime are now readily available online. Easily plugged in, these inexpensive devices work wonders for jet lag and for the nebulous state of fatigue that is often simply caused by the toxicity of modern living. I am a genuine convert to earthing. I keep my bare feet on an earthing mat when I’m working on my laptop and even sleep on an earthing sheet. I feel the difference in my energy levels and I am told I look young for my age, so what have you got to lose? Get earthing now.